Hands up who knew there was a new Terry Gilliam movie out. 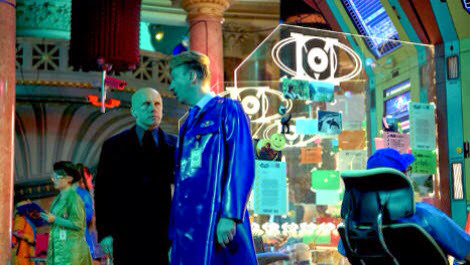 Possibly overshadowed in the light of Gilliam's involvement in the Python comeback that you might just have heard of, The Zero Theorem peeked meekly over the parapet for a very limited cinema engagement before emerging on Blu-Ray and VOD this week. Now, there is a school of thought that considers if a Gilliam film is poorly publicised, it's usually more interesting than his work-for-hire studio stuff. You might get a Tideland, but you might get a Fisher King. And after all, it's Terry Gilliam. 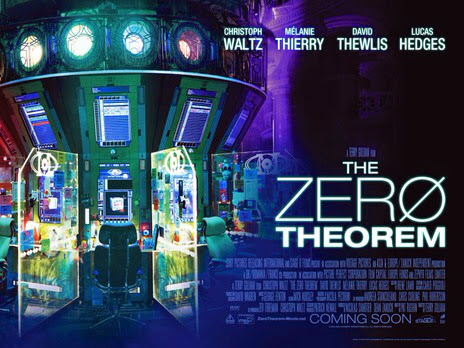 The Zero Theorem should be worth a look… right? Well, yes, but with big fat caveats. It dosn't come within sniffing distance of his best work, sadly. This is no Brazil-in-waiting. It shares the same retro-futurist visual style as the film that made his reputation, but doesn't have the same heart and vigour. If anything it's bleak and bitter film that offers little hope, while cribbing hugely from other, better films. Qohen Leth: crazy name, crazy guy. Let's plot-dump. Qohen Leth is a data analyst working for a soul-less corporation called Mancom. The Management of the company, embodied in one shark-suited individual, sees a use for Leth in one of Mancom's major projects: the solving of the titular Zero Theorem. But the solution of that particular puzzle has major implications for Qohen, that might just have something to do with the phone call he's been waiting for his entire life. 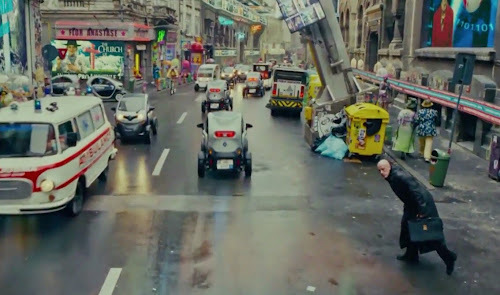 If you read that précis and think that The Zero Theorem is Gilliam does cyberpunk, then you're not far off the mark. The future here is one of advertising screens that chase you down the street, of software that comes in test tubes, of hacking with a gamepad. It's a world of echoing retrofitted spaces, crumbling buildings lit in neon colours. There's more than a few nods to the Blade Runner esthetic, with the occasional shock of the old: Qohen commutes to work in an old Routemaster, plastered in video-ads. As with all SF, The Zero Theorem deals with the present day as much as the future. The problem is that we are all living in a science fictional world now, which dilutes the satirical bite of Gilliam's observations. The video-ads we see in the opening moments of the film are a common sight these days. Qohen attends a party where the guests seem more interested in their tablets and phones then in having fun with each other. Again, hardly a searingly original indictment. 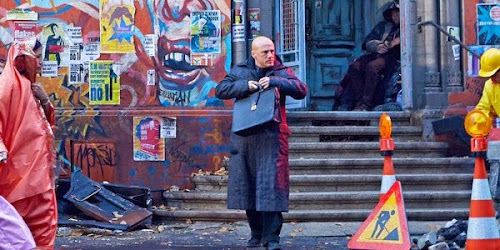 The common Gilliam tropes–the outsider, the quest, the damaged hero healed by love–are all present and correct in The Zero Theorem. If only we could give a damn about the central character. Qohen Leth, played with a shaven head and a vacant stare by Christophe Waltz, is frankly unlikable. His tics and weird mannerisms, such as referring to himself in the third person, are a broad parody of introverted behaviour. He's a cypher, a black hole. Which is kind of the point, but you find it difficult to give a damn about a guy who just wants to stay in and wait for a phone call. It's the problem with any film that largely deals with the life of the mind: how do you portray the unseeable? We're not helped by visualisations of Qohen's data-mashing skills, which involve moving blocks with bits of equations on them into place on a huge 3-D jigsaw. It's the sort of thing that belongs in Johnny Mnemonic, and looks like a rejected concept from The Lawnmower Man. Yes, that bad. If I was feeling generous, I could say that these sequences have a touch of Minecraft about them. Maybe Gilliam is making another point about our lives now, about how we use incredibly complex algorithms in the service of simple and mundane tasks. Or maybe I'm just reaching, and he or his scriptwriter, first-timer Pat Rushin, couldn't come up with a less cliched bit of visual shorthand. At least he doesn't show Qohen's face backlit by lines of green, scrolling text. I'm a big Gilliam fan, and the cast list shows I'm not alone. He's managed to corral a big-name star in Waltz, and snags cameos from actors like Ben Whishaw, Peter Stormare and Matt Damon. The movie looks as you'd expect a Gilliam film to look, a world of crammed-to-bursting visuals. Mélanie Thierry gives an affecting and eye-catching performance as love-interest Bainsley. But he's retreading old ground, and even his usual visual flair feels like it's been done before in other, more interesting films. In the end, the film collapses in on itself, becoming a ham-fisted rumination on the nature and rewards of faith. It doesn't really end. It kind of finishes, with a nod to the devastating conclusion of Brazil, but none of the impact. Does the Zero Theorem get solved? Does Leth come to a greater understanding of the world? I have no idea. Worse still, I don't care. The Zero Theorem is a locked box with a set of keys, none of which fit. I really, really wanted to like it and I really, really couldn't. I felt like I was being kept at arms length, never allowed to engage, never given the chance to do anything but look at the pretty pictures (and in it's defence, The Zero Theorem is very pretty). Which is a shame because his science-fictional skew on the Gilliam Dreamspace, that place where fantasy and reality intertwine and meld, had the potential to be very interesting. Instead it feels fumbled, uncertain, bottled up where it should be arms wide and yelling, sat on the beach when it should be soaring in the sky. I welcome the news that Gilliam's mythical, long-awaited Don Quixote movie may finally come off the starting blocks. Hopefully we'll see the old, wildly inventive and gleefully satirical cinematic madman back at play, tilting at windmills, embracing the great quest. I hope that The Zero Theorem is simply a case of Gilliam holding fire, keeping his powder dry for the journey ahead. If not, then I worry that the constant battles, tragedies and disappointments that have been so much of his life as a film-maker have finally beaten him down, and turned him bitter, cynical and cruising on past glories. But I hope not. I really do.